Hi, and Welcome Joel Cornah. Would you like to begin by telling the readers something about yourself? 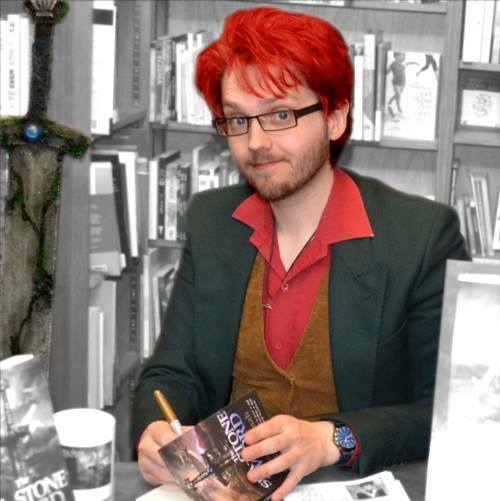 I’m a dyslexic Lancastrian who somehow found himself writing epic fantasy and getting published. I am also a writer and editor for The Sci-Fi and Fantasy Network which has me hopping up and down the country talking to people who were in Doctor Who on camera. I’m a member of the Tolkien Society, a drinker of tea, and I run a bookshop / cafe in Parbold village near Wigan, Lancashire. What are your books about and what inspired you to writethem? 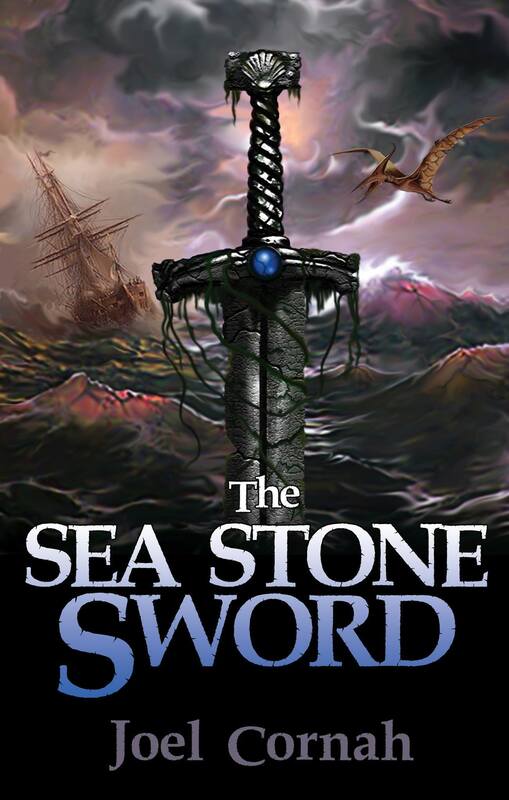 My first novel, The Sea-Stone Sword, is about a boy named Rob Sardan who wants to become a hero, but he gets it all completely wrong. The story is set in a world I created growing up telling stories to my younger siblings; it is filled with dinosaurs, dragons, penguins and more besides. There is a quest, a Pirate Lord, and a magic sword that slowly but surely breaks the wielder and makes them into its tool. I have two supplementary stand-alone novellas as well. The Spire of Frozen Fire tells the story of Jareth Sea-Splitter, a pirate who travels to the gigantic prison of ice and crystal, south of south, the needle of the world. There she seeks secrets and answers, but finds something she did not expect. The Silent Helm is my latest novella. It is the story of Eimhir, a young girl who has lived her life relying on silence, stealth, and secrets. But when she meets a community of human-dragon hybrids known as draigs she discovers a people who live their lives defined by war; those who run from it, and those who embrace it. She must chose to break her silence to save lives, or else be broken by it. Next year I hope to have the next full novel, The Sky Slayer, out and ready for the world! How long did the first book take to write and how many times did you go through it before it was finally done? The Sea-Stone Sword was originally a side project. I had been working on a much longer story called The Dinosaur Prince, and one of the characters, Rob Sardan, had an interesting history. I wanted to write about his backstory and made notes on it. I’d been writing The Dinosaur Prince for about seven years on and off, but when I sat down to write The Sea-Stone Sword, it took me about three months to get the first draft done. I edited it multiple times and it was about a year before it was ready for publishers to look at. When Kristell Ink said yes it was the most amazing moment of my life and I hope the book does well just as a thank you to them if nothing else! Much of the world was created over years and years. There are certainly aspects from the real world that worked their way in – I think bits of Finland are dotted about as well as some of the grimier and gray parts of northern England. But as much of it is set at sea, I think I took some inspiration from Liverpool’s tall ships which I saw regularly at university, and probably remember some vague nautical things from my childhood growing up near Southport. I loved the character Eimhir! She came out of nowhere! I had not planned to put her in the story and I don’t know where she came from. I just had this quiet little girl who was able to slyly and silently make the world work to her advantage. She has such an interesting psychology and it’s probably a reflection of myself in some awful ways. She has suffered a lot of abuse and cruelty, but has come out of it so much kinder, and loving, though she may mask it and try and push those feelings away. I like to have characters who subvert expectations, and she certainly does for me! There’s a new character in The Sky Slayer who is also becoming one of my favourites to write. She just has all the best lines – all the sarcastic and cutting jibes you wish you could say in real life but can’t because you’re too polite. Watch out for Alya Kadir. Did you change direction at any point or was it all plain sailing? Generally I have a good idea of where the plot is going so there are rarely moments where I change direction wildly. Details change and I may meander around a bit but usually end up where I wanted to get to. Like I said, I know where the story is going. I don’t usually plan out meticulously. I approach writing a lot like playing chess against yourself, where you’re playing both the protagonists and the antagonists (and everyone in between). Everyone has their goals, everyone has their style, and everyone has their strategy. Each character has their own ‘checkmate’ in mind, but you also realise that if things work out in certain ways, they may have to settle for a stalemate. I usually know what the antagonist is trying to achieve and how they are going to do it, so it’s a case of finding a way for the protagonists to move against them and work out what’s going on. Sometimes, I will realise that one character hasn’t been playing chess at all – they’ve been playing poker, and they have an ace up their sleeve. But then my analogy starts to break apart and become incomprehensible. I tend to write with themes in mind and that helps shape the story and the characters. The theme of The Sea-Stone Sword was stories, heroes, and villains. A lot of it revolves around those ideas and different interpretations of them. As things come to mind, I write them, but it’s all centred around a framework and theme. They’re all available from good bookshops, (and no doubt some bad ones too). Smashwords, Amazon, Amazon UK, Barnes and Noble, and Book Depository. The next book, The Sky Slayer, will hopefully be out next year. It is the story of Rob Sardan’s next adventure. The Sky Slayer’s curse is upon him, and the only way to break it is to escape from the dreaded prison at the end of the world. To do so, he will need the help of an aging doctor, a failed thief, a former pirate, and a strategist who simply cannot be trusted. Thank you so much for having me on here! This entry was posted in Uncategorized and tagged fantasy, Kristell Ink, pirates on September 28, 2015 by cnlesley.